« International travel safety. It all starts with planning & the ability to communicate. If your home is recessed from the road, does the driveway have good lighting? Dusk-to-dawn low level lighting is thought to be a more effective deterrent than motion detector lights. Be sure the home, garage, side areas and parking area are also very well lit. Prune or remove shrubs and bushes that offer natural cover to an intruder, especially near ground floor windows. The more open your “lines of sight”, the better. It is best to close drapes at dusk, dawn and during night time hours. The door to storage sheds should be locked. Don’t leave stepladders on the side of the house. They offer easy access to upper floors. Hang a small bell from entrance doors so you know when the are being opened or closed. Your doors should always be locked, even during the day. Ground floor windows should only be opened part way with secondary securing devices to prevent them being pulled open or pushed up. Be sure to know how to use your home alarm system’s “silent” and “panic” functions. Wireless fobs are always a good idea. Can you activate your car alarm from inside your home? If so, keep your vehicle key fob close by as an additional alarm option. Dogs are always an additional deterrent. If you do not park your vehicles inside the garage, it is best to not leave the remote for the door in the vehicle. Make a habit of bringing it inside with you. Be sure to also lock the interior door to the garage even if the garage doors are down. Designate a “safe room” with a sturdy door where you can retreat with your cell phone if need be. Be sure that you receive a cell signal in this room. Preferably this room does not have a window. Keep a flash card with your home address, a flash light, bottles of water and a fire extinguisher in the safe room. If you are not calling from a land line, the 911 operator will not know your address. You can easily read your address from the flashcard if you are in a state of fear. The safe room (Sometimes referred to as the Panic Room in Hollywood) is where you want to secure yourself and family members if you think or know an intruder is in your home and exiting the dwelling is not an option. This is the room from which you will call 911 and stay secure until help arrives. Never open the door to a stranger regardless of how legitimate their story or how well groomed they are. Looks can be deceiving. Call the police if you are uneasy. Think “outside the box”; consider the incident of a woman who purchased a magazine subscription from a seemingly sweet young man on her doorstep. Upon his return the following day “to correct a paperwork error”, he violently assaulted her. Remain alert when leaving or returning to your neighborhood. We let our guards down in familiar environments. This is why most car accidents happen less than two miles from home. If you think you are being followed do not drive home. Proceed back to a well light busy area or a police station and call for help. Try and vary your route home from time to time. The less predictable you are the more difficult a target you become. If you live alone in a gated community, add a second letter to your first initial. For example, “J & L Smith” on the complex’s directory board. Also, be aware of the areas around the entry driveway, especially if you need to open your window to use the keypad. This area should be well lit and not offer convenient hiding places. Your outgoing message should be limited to “We are not available right now. Please leave a message.” This should be recorded in a mans voice even if a man does not live there. Do not give out any additional information or confirm the phone number the caller has just dialed. When you come home if you find the door unlocked or open, do NOT go inside. Retreat to a neighbor’s home, your vehicle or a well lit, busy area. Call the police for help! If you happen upon intruders upon entering your dwelling exit your home immediately, progress to a well light busy place and call the police. 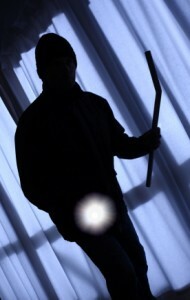 Do not confront, challenge or close distance on an intruder. These are the situations where an intent to rob may rapidly degenerate into violence. Your focus is on your safety. Property can be replaced. Review telephone and front door rules with your family periodically. Remind them to always pay attention to their instincts. This entry was posted on December 23, 2008, 11:48 pm and is filed under Home Safety. You can follow any responses to this entry through RSS 2.0. You can leave a response, or trackback from your own site. Shots fired in the building. A Gunman on the Loose!